Discussion in 'The Lounge' started by ICEBALL585, Sep 25, 2012. 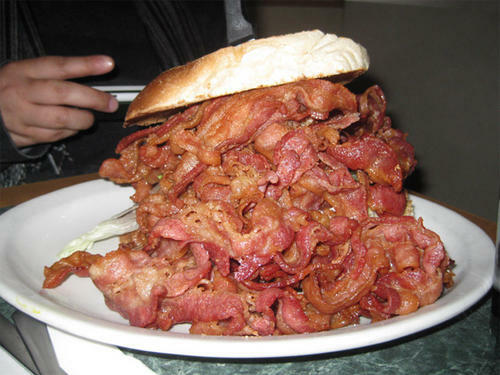 Global bacon shortage "unavoidable", group says. A world without easily available bacon? I don't want to live on this planet anymore. It's the beginning of the zombie apocalypse. I always new in the back of my mind that the zombie apocalypse would be bacon related.. I'm predicting there will be the great bacon riots of 2013. Start stockpiling today and you will be safe. Is it possible to eat sh*t bacon? Cuz my girlfriend made some bacon the other day and it stunk while cooking and tasted funny while eating. But mixing it in with a blt, it wasn't as bad. Still not sick..... stinky bacon must still be good bacon. I'd keep a bucket by the toilet if I were you.